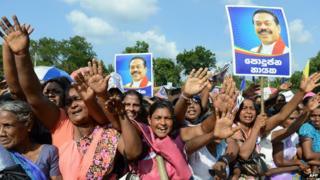 Is Rajapaksa facing defeat in Sri Lanka elections? Image caption Mr Rajapaksa's followers often refer to him as "the king"
President Mahinda Rajapaksa hopes to be re-elected to a third term in Sri Lanka's election on Thursday. But what sort of a country has Sri Lanka become under Mr Rajapaksa and his brothers? One day last month six astrologers were brought onto government television to discuss the prospects for the presidential election. All six declared that not only would President Rajapaksa "secure a fabulous victory" but "nature" would "completely work against" anyone challenging him. For nearly a decade Mahinda Rajapaksa has been the undisputed leader of Sri Lanka - perhaps I should really say "king" because that's how many of his fans refer to him. He is frequently compared to a conquering Sinhalese monarch of ancient times. Not so long ago state television featured a lullaby on how the "king" saved the country from the Tamil Tiger rebels. True, there is fear there as well, given that his three brothers are respectively the defence chief, the economic development chief and the speaker of parliament - but no one doubts the Rajapaksas' power. But now the "monarch" may be in trouble. No sooner had he announced the snap election than a serious challenger came forward to oppose him for the presidency. Maithripala Sirisena was a senior politician at the heart of Mr Rajapaksa's own party. He has nothing of the president's jovial, folksy charisma. But, coming from a farming family in the Sinhalese heartland, he appeals to the same demographic, while being backed by a large opposition coalition that kept his name secret until the final moment. A stream of other ruling party luminaries followed him in defecting. Defections are common in Sri Lanka. But in recent years nearly all defections have been to the government. Now the tide is reversed and there is dark talk of betrayal. Noting that Judas Iscariot hanged himself after betraying Jesus Christ, the state-owned Sunday Observer commented: "Maithripala, too, will suffer the same fate as Judas after his imminent defeat." The paper said voters should "teach these traitors the lessons of their lives". But the 69-year-old president suddenly looks vulnerable and tired. He was even forced to abandon a recent election speech halfway through. Sri Lanka is sharply divided politically, thanks to decades of war and violence based around divisions between the Sinhalese majority and the Tamil minority. Many, mainly Sinhalese, still revere the president for winning the war against the Tamil Tigers and getting a lot of post-war infrastructure built. But others - including the vast majority of Tamils and also many in the Muslim minority - want him out. Tamils feel the whole structure of the Sinhalese- and Buddhist-dominated state marginalises them, while Muslims are reeling from a series of attacks by extremist Buddhist monks tolerated by the Rajapaksas. But how meaningful a change would Mr Sirisena bring? Standing on a manifesto of anti-corruption and constitutional reform, he has an unwieldy coalition. It includes a former president who has actually apologised for the past treatment of the Tamils. But it also embraces a hard-line Buddhist nationalist party - a defector from the ruling coalition - that completely denies the well-attested evidence that thousands of Tamil civilians died in the final bombardments of the war. Mr Sirisena has made no mention of minority rights or of any political solution to the ethnic conflict and has ruled out allowing any political leader to be prosecuted for alleged war crimes. But whatever the loopholes, it is Mr Sirisena that has momentum. A government hitherto seen as impregnable seems to be floundering. As the number of defections to the opposition mounted, the president said, ominously, he had "files" on the defectors but would not use them for political advantage. These are figures who had been his close colleagues a day earlier. The main Muslim politicians in Mr Rajapaksa's coalition have now abandoned him; while the main Tamil opposition party, the Tamil National Alliance, says the Rajapaksa government has brought "only pain and suffering" to Tamils and Muslims and they should vote for Mr Sirisena. Beyond the minorities, many Sri Lankans are exasperated at rising living costs and at a culture of political thuggery and violence which only seems to grow. During the election campaign many actors, singers and artistes have campaigned against the government. Their rallies have been attacked by pro-government mobs leaving some people seriously injured. In other election malpractice, the army was found to have used state money to post pro-Rajapaksa propaganda to hundreds of thousands of soldiers and their families. There is everything to play for in this election. Mr Rajapaksa could still win. But should "the king" lose, many Sri Lankans are wondering whether he will hand over his crown without a fuss, and whether this powerful family will go peacefully if it fails to secure that "fabulous victory" foretold in the stars.